The Demon Broadsword Falchionis for brave warriors seeking a unique weapon with sinister appeal. The stainless steel, single edged blade widens and curves slightly upwards at its end, and detailed skulls decorate the black steel hilt. A stunning display of understated gothic style, the skulls of this saber accent the blade collar and pommel, separated by the faux leather-wrapped grip. This black wrapped handle provides a firm grip for the wielder. A black nylon sheath is included with this decorative gothic blade for easy storage and carry. 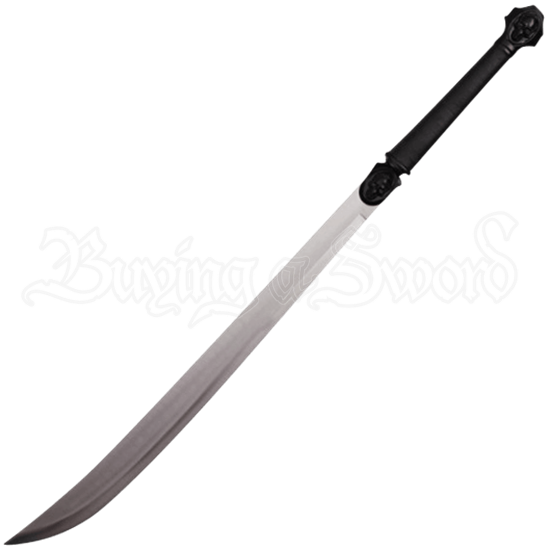 Whether you add its macabre beauty to your own home decor or gift it to a friend fond of gothic weaponry, the Demon Broadsword Falchionmakes a great collectible or display piece.